There had been a few things that I wanted to do with Bob but never got to do. Since he had always worked in the South Bay and wouldn’t come home until at least 7:30pm, we didn’t ever get to do anything of these things. One of them was to hang out with him after work. I always envisioned myself meeting up with him at Ocean Beach and taking a walk with him on the beach before both of us heading home. I know we are in a difficult situation of losing a job and trying to find a job. It could be a little silly to be “happy” about being able to hang out on the beach when one does not have a job. But, it is what it is. And since this is the reality, I feel that it’s okay to celebrate the facts that we have each other, we are healthy, we like hanging out with each other, we have the time now, and we live so close to the beach. So for now, I would like to enjoy the “perks” that this season of life has given us, including having the time to take a walk on the beach when we feel like it. We walked hand-in-hand with our down jackets on. Our shoes were filled with sand. We chatted about his day and my day. We talked about potential jobs and leads. We laughed. We kissed. It was magical. Nothing better than a purse-holding husband who also tries his best to enjoy life during this season of challenges. Remember my friend Anna? She actually never wrote me back after I emailed her several weeks ago about our pregnancy loss and my emotional state with her pregnancy. I had been waiting every single day and thinking that I must have offended her with my email. I thought about emailing her again, texting her, or even calling her. Then I decided to just wait to see if I would bump into her at church. Week after week I didn’t see her. Finally, this past Sunday, she was one of the first people I bumped into right when I walked into church. Her big pregnancy belly greeted me. Honestly, she looked good. Once she saw me, she apologized profusely for not writing me back. She said that she had been the most horrible friend. She thought about me often but did not write me back. I told her that it was okay. I was actually relieved that she wasn’t mad at me. I told her that I was worried that my email offended her. She reassured me that she wasn’t offended at all. So we proceeded to chat about her pregnancy and Bob’s job loss. Just a bit of catching up after not seeing each other for a couple of months. I made a few observations about this encounter. 1) I was more worried about her being mad at me than anything else, so it was quite a relief to know that she wasn’t. 2) I was surprised by how big her belly already was at 19 weeks. 3) I was more surprised at my own reaction of hugging her and being with her; I was actually not repulsed by her presence. I was happy to be around her and I was not feeling like I wanted to flee or hide from her. 4) I was also not repulsed by her updates about her pregnancy and details of the discomfort that she has been experiencing. Conclusion: The Lord is good. I have been praying and praying for my heart and the last thing I want to do is to distance myself from a close friend, one who had tried for a long time, because of her success. I want to be able to celebrate with her. In the most unexpected way, looking at her glow and seeing her growing body, instead of jealousy and bitterness, God allowed me to see the beauty of this friend and the miracle that is growing inside her. He is allowing me to see the importance of this friendship and allowing me to cherish it. I originally thought that I would have a difficult time being around her. After all, I had never been in this situation with a close friend who finally found success after trying for a long time. But, I am happy to report that we are making plans to get together before my overseas trip. So that means that I feel okay being with her. I even told Bob that I think I can attend Anna’s baby shower in the future. I can’t tell you how big of a change this is for me. The Lord is changing my heart. I don’t even remember the last baby shower I attended. Let’s see how good I will be when the time comes. I declare this a victory. Yesterday was cycle day one. I am usually okay with AF’s arrival. However, this CD1 is not the same as other CD1 this year. My goal that I set for myself last Christmas was to have a baby in my arms by the end of 2014. I always have this deadline in my head that we would have to be pregnant by March in order to have a baby by Christmas. Not God’s plan. This time it hits harder. I was in a bad mood yesterday. All sorts of lies from the enemy came into my head. You’ll never have a baby. You’re wasting your time. You’re not meant to be a mom. It took a lot of prayers to get these thoughts out of my head. Satan. Go away. Never underestimate the effect of a failed IVF cycle on a person’s emotional well-being. I for one have been surprised by how unwilling I am to think about the next steps. My head just needs that space to be IVF free. I am not even taking my prenatal vitamins or other supplements that were recommended by my RE. I have been praying for peace, strength, and wisdom for the next steps. I have also been praying for my motivation to think about the next cycle. So far not much motivation to speak of. I declare this a failure. One victory. Not bad at all. What am I talking about? I am talking about finding treasure somewhere unexpectedly. So it goes like this. Remember I talked about all the weddings that will happen this year in the last post? One of my friends had a wedding shower yesterday. She is the one who moved away out of state and will get married in June. Her bridesmaids arranged for a wedding shower for her so that she can introduce her fiance to many who hadn’t met him. I intended to buy her a shower gift. Online search showed that the one item that I wanted to get was in stock. This little thing is a garlic keeper. So it required a little bag rather than a big bag. Being cheap and not wanting to spend money on buying a gift bag, I searched in a pile of bags from previous gifting. I found a nice silver bag. On the tag it said that it was a Christmas present from one of my therapy kids’ moms last December. It was perfect for the garlic keeper. It even had tissue paper inside. Then, I spotted an envelope inside the bag. Something that I had never seen or noticed when I received the gift. A Christmas card. And a $25 Targ.et giftcard! Isn’t it like finding Gold? And the weird part? Turned out the garlic keeper wasn’t in stock after I called the store. Why did it say it was? The store person couldn’t give me an answer either. We didn’t get to buy it. So I didn’t get to use the bag. The moral of the story? Always look through the whole bag when you receive a present. 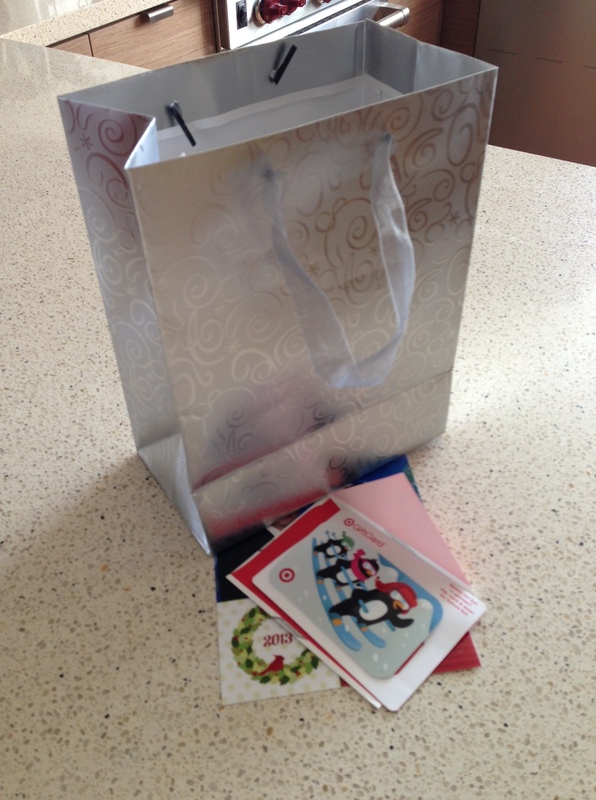 And this giftcard is going to fund a maxi skirt that I want to buy at Targ.et. See who is grinning from ear to ear? This bridesmaid got married about a month or two after my wedding. Her son was born 10 months after that. She is going to give birth end of June, again. So if we had gotten pregnant right after our wedding, we could have a two year old like the cutie pie that we saw yesterday. Would’ve been nice, wouldn’t it. I know that I shouldn’t compare. I have my own path. But for three hours, I was reminded of what I really really really want and what I don’t have yet. It was tough. So… What does a woman who struggles to get pregnant think about when her friend is engaged? I don’t know about you. 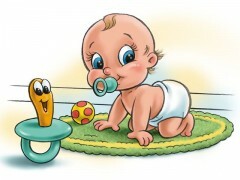 Lately the first thing I think about is, I hope she doesn’t try to conceive right away. So why does it have to be always about me? I don’t know… because I am selfish? But I can’t help myself. This is a brand new thing though. I didn’t have the same thought last year. Oh maybe because we were knee deep into our fertility treatment last year that we didn’t pay attention to other people. This year, I have some room in my head to think about others, especially those friends who are getting married. One wedding in mid-April before our overseas trip. The bride is 38. I am quite sure she will try for a baby very soon. Another wedding is in end of April. The groom is my friend and has expressed concerns of trying for a baby “so late”. He is 30 and the bride is 33. Yet another wedding we’ll try to attend in another state. That one is in June. The bride, my friend, is in her early 30s. Finally, my coworker who got engaged over Christmas and will get married in October. I have heard her say multiple times that she can’t wait to have a baby. I don’t wish this struggle on anybody. Really. But I, for obvious selfish reasons, do not want any of these friends to try to conceive right after they get married. I don’t want them to struggle, but I don’t want to deal with the pain of yet another pregnancy announcement so quickly after a wedding. The best solution for me, admittedly and shamefully selfish, is for them to enjoy their newly married life for a little while before they try for a baby. And hopefully by then, I will be rubbing my own big belly while saying congratulations to them. Not too much to ask for?? Life continues to change unexpectedly. A week ago, we wouldn’t have guessed that we would be taking a trip to see family in India and Hong Kong mid-April. About five months ago, I wrote a post celebrating being married for 2.5 years. I listed all the things that we had experienced as a couple in those short years. We are now adding one more item to the list: the loss of a job. Bob called me at 5pm exactly one week ago informing me of “a bit of a bad news”. He was let go by his company. We went through a lot in our relationship to finally decide to take this job. You can read about it here, here, and here. From August to October last, I went from being ambivalent about switching from a big corporation to being proud of him that he was willing to take a risk and try something that he liked. We prayed and sought the Lord’s guidance. We believed that it was God’s leading that we finally decided to take that job. We still believe that it was a good move. In this situation where he was let go, I believe that he was being wronged and treated unfairly. For that I have been angry at his bosses and have been bitter about it. But, there is nothing we can do about it but to accept the fact that he no longer has that job. Thanks to this biblical financial workshop that we took a couple of years ago, we have saved up funds for emergency such as this. We also have separate funds for trips (which my husband passionately called our “Babymoon” fund), IVF treatments, and a replacement car. I still have a job. We did some math. My monthly income and his unemployment income should be enough for our monthly expenses if we cut things down a little. Praise the Lord that financially we can last for a while before he finds another job. However, it’s not the finances that I am worried about. I am worried about a man’s psyche… of losing a job, not being able to provide for his family for a little while, and the self-doubt (albeit temporary) that may come with the job loss. 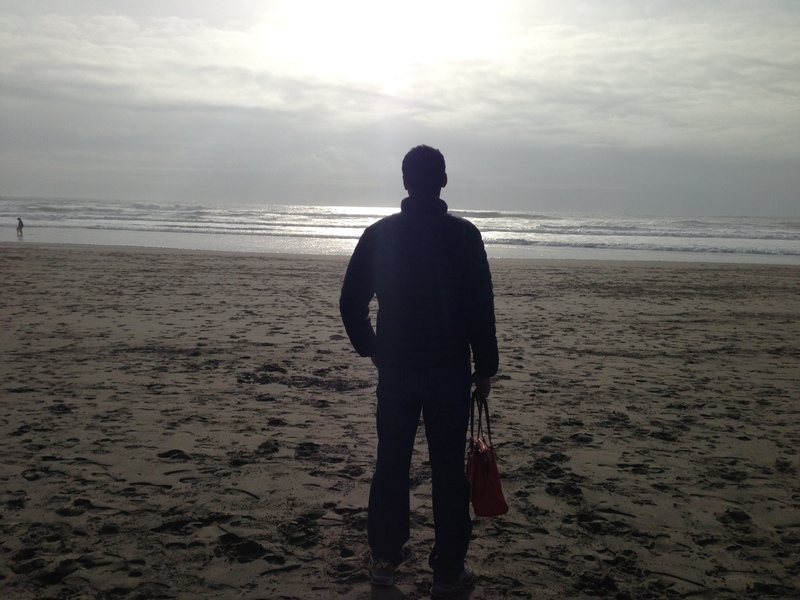 We were in shock for a little… I don’t know what stages of grief we have been going through. I mean, back in January, we were in shock that his bosses used this smallest misunderstanding and blew it up big time. They gave him an “official warning” with an HR person in presence without even talking to him about what happened or hearing his side of the story in private first. He was told one thing by one boss but another thing by another boss. The two bosses’ stories didn’t match and he got blamed for it. At that time, we were saying that if this company was not the right one for us, and if he was let go, then we would take a trip to India and Hong Kong. We have wanted to go but there never seemed to be time in Bob’s work schedule. Every time he switched jobs, he was talked into taking the new job right away. It has been two years since we went. But I really did not think that these people would actually let him go because of something so small. At the end of last month, he was told by his boss that everything was fine. The lesson is, not to easily trust when someone like his boss said that everything was fine. My husband worked so hard at his job and loved it. It was the people that made it a difficult work situation. My heart hurts for him that he lost his job under these circumstances. For now, Bob is taking a break. He has been home. He promised me that he would change out of his pajamas daily and he has been doing that. He has been taking care of some maintenance in the house. My brother asked him for his resume and has forwarded it to the appropriate department at his company. There were companies that he had turned down second interviews previously. So there are leads that he can follow. But I think it IS a good time for him to take a break. He went to the library that he never had the time to go to and really enjoyed his time there. When we did the budget, we discussed about whether or not to continue to pay for our fitness bootcamp. I strongly believe that working out is going to keep him sane and fit when he’s unemployed. So we wrote our bootcamp instructor, told her this situation, and asked if we could get a discount until he gets a new job. She said she’d work something out for us. So Bob still goes to early morning 6:15am bootcamp with me. We also got into a huge fight over the weekend. I can’t even remember the last time we got into a huge fight. I guess losing a job can do that to you. Let’s just say that our ears are highly sensitive because we are highly sensitive these days. We totally misinterpreted the intentions of what we said. Instead of walking away and letting go immediately, like what we would usually do, we chose to fight. It was ugly. And we made up quickly, like usual. But in the moment, I realized that I have to allow Bob time to heal and mourn this situation and not to underestimate the impact of this news, despite us being financially secure at this point. In my morning prayers, I asked the Lord to give me extra patience and love for my husband during this time. We originally were going to plan for a trip for Hawaii as we had always wanted to go to Hawaii for our honeymoon. After we got married, I was too tired to plan for a trip like that so we never went. But after a lot of thinking, I feel that visiting with family is more important than us lounging around on a beach by ourselves. And I want to do the international trip when I am still taking a thinking break from the next IVF cycle. In the big scheme of things, it will be okay to wait for another month or two before we embark on the IVF journey again. Bob asked me if I wanted to do a cycle before we leave for the trip. I gave him an “Are you crazy look?” We are not doing a cycle before we fly out. So how about we talk about what to expect in India? Well, we can’t talk about our expectations without talking about my father- and mother-in-law. Before we booked the plane tickets, I insisted on Bob calling his parents to tell them our plans. His mother was very upset that he lost his job and that it was the result of him “abandoning” his big corporation job. He heard no consolation from her. The next phone call, she complained that he did not buy her a house like she wanted, as she compared herself to her friends whose children bought them properties. And now that he lost his job, she has to wait longer for the money that we give them annually. I get so mad at her sometimes for not even asking how he is doing. All she usually says is to blame him for things. She also complained that I was yet again going to be there in India the whole duration of his stay. She was envisioning me leaving early so that she and my father-in-law would get some alone time with Bob. Well, MIL, it is not happening this time. I am going to be sticking with Bob the whole time. Hong Kong will be a much more pleasant place to be in terms of friends and family that we will see. I haven’t seen my dad for 18 months. I can’t wait to hang out with him. Both of my grandmothers are in their 90s and are alive and well. I am thrilled to be able to spend time with them. My paternal grandmother, with whom I grew up, last time joked that Bob would not be allowed to return to Hong Kong without a baby. Poor woman, I think she stopped joking about that. Instead she wishes us for all of our dreams to come true during Chinese New Year. I will also see my childhood best friend and maybe tell her all the details about the cycles that we went through. As for our TTC effort this month, I ovulated but I didn’t know exactly when because the temperature shift was kind of weird. We timed it every other day so it was quite well timed. This is our last chance to reach the goal of having a baby in our arms by Christmas this year. Hoping and praying that I will receive the biggest surprise of my life. I went to acupuncture a couple of times and Maya abdominal massage once. But, I haven’t written Dr. E after she checked in with me a week after our pregnancy loss. I have not taken any prenatal vitamins since AF came. I have stopped DHEA and the other supplements. I guess, I just need a break. So here you are. The update of my life. We are going on an unexpected trip to recuperate and rekindle our relationship with our family and friends, and on an unexpected trip of navigating the world of unemployment. Although we are bitter at times, we are still grateful for all the blessings that have been poured upon us. Life is still not too bad. How I feel about pregnant ladies and newborn babies has been very weird, and random. So how do I feel? It depends on who it is. Sometimes, my feelings have no rhyme or reason. I didn’t mind certain newborns. I actually went to seek them out. My heart didn’t skip a beat and I didn’t feel repulsed by them. And then, there are certain women that I am friends with. I want to avoid them like a plague. One of them was the friend who announced her pregnancy on Christmas morning. She was flaunting her big belly in this adorable dress and all I could do was to say hi. I couldn’t bring myself to ask her how her pregnancy was going, how she was doing, etc. Then her husband approached me about 15 minutes later, gave me a friendly hug, and asked me how Bob and I were doing. I could not tell him our painful experience a few weeks ago. I just gave him the generic “we are good”, which we are. But there is so much more to it and I could not share. At the service right before sermon, this couple appeared on screen on a pre-recorded video, talking about their “storm” in their life with the birth of their second child as he was diagnosed with a genetic disorder. In the video, she talked about the joy that was robbed of her, that her child may never attend prom or get married, yet Jesus came through and gave them hope. Now that they’re expecting their third, she feels redeemed. Because of her experience with her second child, she has no expectation of how this pregnancy would turn out. I found myself tearing up for her experience as it must have been very painful for her to have a special needs child who was very difficult to take care of early on. But at the same time, I couldn’t help but think that I still want what she has, that she has a chance yet again to be redeemed, and am jealous of it enough that I don’t really want to talk to her. And then I had the privilege to hold a 2.5 month old baby today during a meeting. His mother has had difficulty conceiving. Instead of doing A.R.T., she and her husband opted for adoption. After one adoption heartache over a year ago (with the Russia adoption ban preventing them from reuniting with their son), they were matched with this birth mom about two weeks before the baby was born. It is a beautiful story. I see so much love from this couple for their baby it makes me want to squeeze them tight and join in this love. The baby is getting cuter and cuter every week I see him. Last week I sat next to his mom during service hoping to hold him and he fell asleep. So today at a meeting I got to hold him while his mother was hosting the meeting. This is the most snuggly snugbug ever. He hung out for a little with his eyes wide open. With his strong legs and feet, he was able to stand up for a little. After not even fussing for a little, I rocked him to sleep standing up. Whenever I sat down, he opened his eyes again, which forced me to stand up. Eventually, he was deep asleep and I could sit down comfortably with him lying on me. After the meeting, a friend came by and said, You look good with him on you. And I said, I hope one day we’re blessed to have one for our own. I loved loved loved loved loved holding him. His smell was so yummy. His cheeks were perfect and it felt so nice to rub his tummy. His little hands were so perfect. He was just perfect. I am so happy for my friends for this gift of life and I really hope that one day I get to experience it as well. Another girl had her baby shower yesterday. I didn’t attend. I saw her from afar and I didn’t go up to her or say anything to her. She tried for years for a baby and was shocked to find herself pregnant right before they signed paperwork for an adoption agency. She has one of those myths or miracles happening to her in her life: once you decide to proceed with IVF/adoption, you get pregnant. I am not necessarily jealous of her, but I just don’t want to stand next to her, hug her, or do anything with her. She is someone who struggled and finally got pregnant. But I still can’t. Yet there is another woman who recently gave birth to her third. I was very surprised by her pregnancy because she already has two older children (probably in 3rd grade and kindergarten), and she is in her 40s. For some unknown reason, I was very jealous of her pregnancy. Later I learned that she struggled for a long time before conceiving this one. But that didn’t help with how I felt about her. I didn’t attend her baby shower either. Good thing I didn’t. I saw a Facebook photo of all the pregnant ladies who attended that shower. I just don’t think I could handle seeing all these ladies standing together for a photo. I also saw a newborn photo shoot on Facebook with her and her new son, which I quickly clicked it away as I didn’t want to see it. I got together with my maid-of-honor for a dinner. She is single and dating so she’s not thinking about kids anytime soon. However, her friends are all married and starting to have kids. It has been very tough for her. Last August, she celebrated her birthday with me and another friend of hers. This other friend is known to be beautiful and generous. She recently got married and wanted to try for a baby very soon. I casually asked my maid-of-honor about this beautiful friend. Of course she is pregnant and is due in June. Although she had an early pregnancy loss before quickly getting pregnant again with the current baby, I found myself not having any sympathy for her loss mostly because it was so very easy for her to get pregnant and keep the pregnancy again. Isn’t it mean for me to think and feel that way? But I couldn’t help myself. So I don’t know… I am sorting through my own feelings. I am doing better and better each day with the healing part. I still get sad at times and still mourn the loss of Clay and Eli, but I think it’s normal. But somehow, this experience of pregnancy and loss set me back a little with my uneasy feeling and jealousy with others who are pregnant or just gave birth, sometimes regardless of their own prior struggles or losses. I know that God is a God of healing. I need His grace and mercy daily. I also need Him to help me get better again with these feelings so that I can continue to have peace and be able to celebrate with others’ happiness again. This is the journey. There are three steps forward, then there is one step back. As long as I am moving forward, I am okay. I would rather acknowledge my own feelings and work through them again than being in denial about them. Work in progress. As long as God is helping me, I am going to be fine. I was so touched. 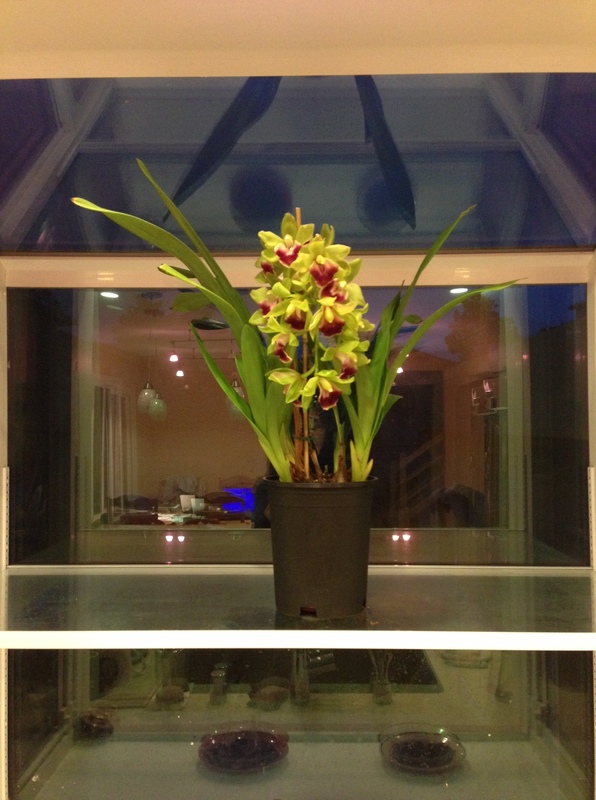 The orchids has definitely brightened my life as well as my garden window in the kitchen. I was so so so so so shocked and very very very surprised. 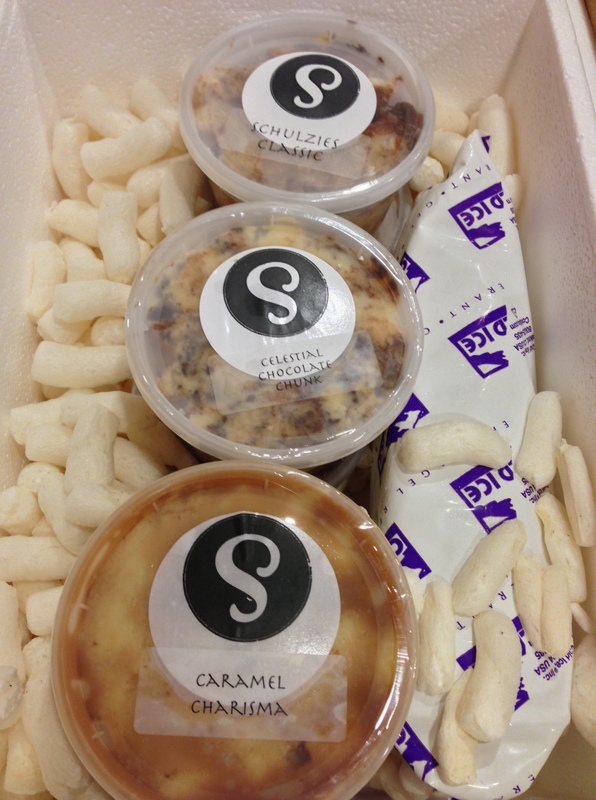 In that big box, there were six tubs of Schulzies bread pudding of three different flavors. It came totally out of the blue. Schulzies is a bread pudding shop in San Francisco with 108 flavors. When you go to the shop itself, it’s like buying ice cream. You order a scoop, then you get it in a cup. I almost cried. They are so thoughtful. They knew that my favorite dessert is bread pudding and they found a local store to buy me a lot to cheer me up. I was stunned and speechless. I am still stunned at the thoughtfulness and generosity of these ladies. Thank you R and A. You ladies sure know how to take good care of me. Deepest gratitude from my heart. Taking good care of my self and being cared for by others feel so good.